In some ways her story mirrors that of Artesa itself—one of European winemaking traditions grafted onto California soil. The family that owns Artesa is the grand winemaking family of Spain whose company, Codorniu, is one of the oldest in the world and has been making wine since 1551. That’s not a typo; the Raventos family, now in its 18th generation, has been in the wine business three centuries longer than California has been a state. 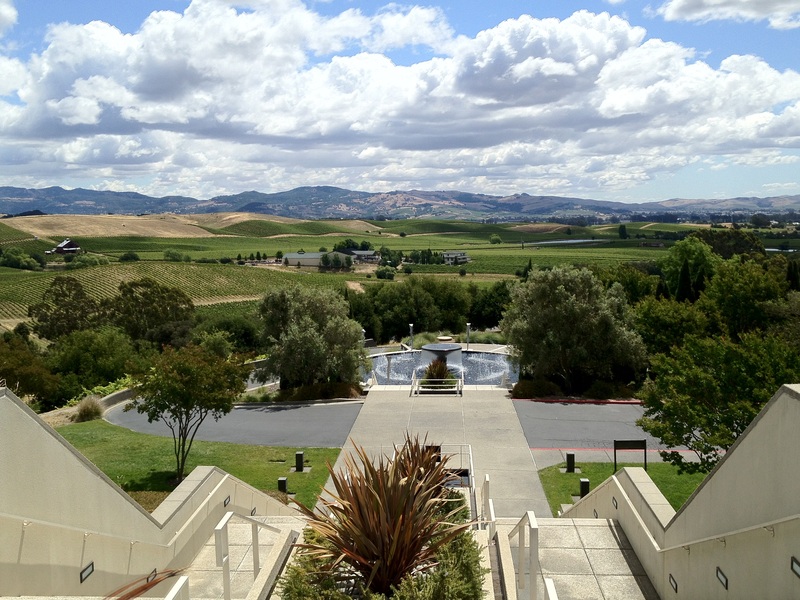 It is this merging of traditions—Old World and New, European-style winemaking and American high tech methods—that so excites Diogo-Draper and Susan Sueiro, Artesa’s general manager, about the Carneros Region winery. Sueiro and Diogo-Draper were talking one afternoon in a tasting room at the hilltop winery with its world-class view of the Carneros region and the north bay. (On a clear day you can see the Golden Gate Bridge.) Five glasses of wine were arrayed invitingly on a table in front of us—a sampling of its portfolio of 20-plus wines. One was a 2014 Albarino, a light, aromatic citrus-y white similar to a Pinot Grigio but its heritage is Spanish, not Italian or French. Spain grows lots of Albarino grapes, where the wine is very popular, but Artesa’s take on it comes entirely from the Carneros appellation. Another wine on the table, a red Tempranillo with bright dark cherry flavors, also has Spanish flair. Go to the La Rioja region of northern Spain and you will see Tempranillo planted everywhere. But Artesa gets its Tempranillo grapes from Alexander Valley in Sonoma County, and the wine’s success —it is the top seller for visitors to Artesa —is a kind of affirmation of the winery’s vision to pour a little bit of Spain into the glasses of the Golden State. The pairing we were doing this afternoon—its “Pintxos and Wine” pairing, one of a number of tastings offered there—consisted of a plate of Basque-style treats including Manchego cheese and membrillo (quince paste), Spanish Chorizo on potato with country Spanish mustard, and other flavor-laden small bites. We kicked things off with a glass of Codorniu Grand Reserve Sparkling Wine or cava, which also happens to be one of the reasons Diogo-Draper joined Artesa. After coming to California in 2005 she worked at Rutherford Hill in St. Helena as an assistant winemaker before moving over to Artesa and eventually taking the top winemaking job last year. Known for its cava, Codorniu has been making the Spanish sparkling wine since 1872—22 years after California became a state, to keep track on the historical timeline—and Diogo-Draper, who had never made sparkling before, “loved” the challenge of doing it at Artesa. One thing she has learned already about cava: “It is very, very demanding and the math has to be right on. I didn’t sleep for a week my first tirage bottling,” she said with a wide smile. In Portuguese culture, she explained, wine is an every day fixture at the family dinner table, so she grew up with it and regards it as one of life’s finer necessities. The same is true for Sueiro, whose family is of Spanish descent. At every holiday family celebration when she was a girl in New York, the wine at the table was Codorniu. Her father was a Spanish-born chef, and his uncle grew grapes and made Albarino in the old country. A former longtime employee at Gundlach Bundschu winery in Sonoma, she became Artesa’s GM at about the same time Diogo-Draper was taking control of the winemaking, so the two are as excited about Artesa’s future as they are respectful of its past.